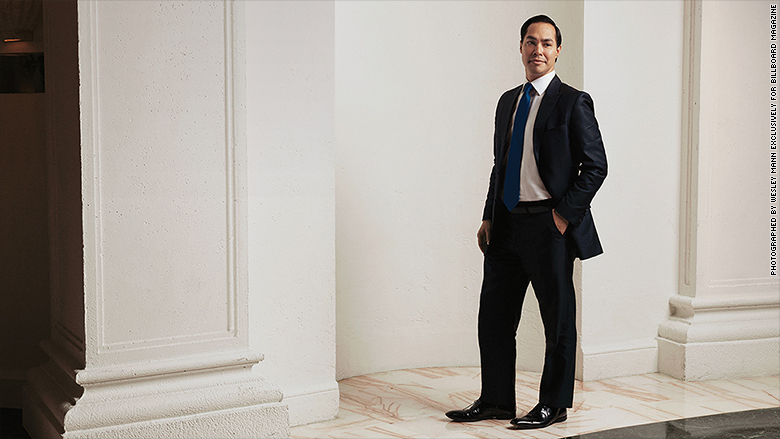 Is Julian Castro the Great Latino Hope of America? Early in the election cycle, when Republican presidential frontrunner Donald Trump called for a wall to be built across the Mexico-U.S. border (which Mexico would pay for) and characterized Mexican immigrants as rapists and murderers, the Latino community mobilized in a way that had not been seen in previous elections. There were picketers at Trump properties, protests across the country and, notably, outcry from the Latin entertainment community, especially musicians. At one concert in Los Angeles, Fher Olvera, the lead singer for Mexican rock band Maná, encouraged the crowd to vote as he compared Trump to Adolf Hitler. After receiving an award at Univision's Premio Juventud ceremony this past summer, Pitbull used the platform to speak to the other candidates: "Now that I have the microphone, let me say something... I'm not political, I'm a musician, but above all I am Latino," he said, and called on Democratic frontrunner Hillary Clinton and other candidates to step up their game to prevent a Trump presidency. The man who may well be the next vice president of the United States is delighted that artists are speaking out against Trump's nationalist invective. 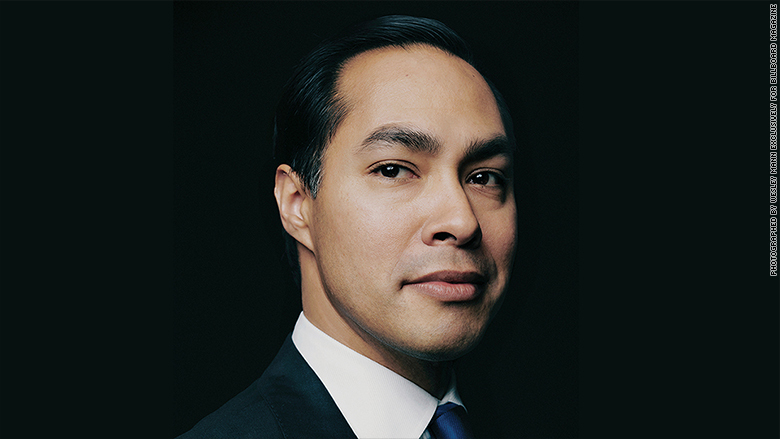 "I'm a big fan of entertainers who are socially aware and not afraid to speak up," says Julian Castro, 41, the Secretary of Housing and Urban Development (HUD) under President Barack Obama. "As a country we need to turn in a more constructive direction than Donald Trump is trying to lead us. He has unleashed prejudice in a way that we haven't seen in quite a while." Castro is an ardent Clinton supporter, and is widely rumored to be on the shortlist of her potential vice presidential running mates. On this March day, he has just spent the morning at a Miami public housing development announcing a new initiative to connect the complex to the Internet. Flanked by two young African-American aides dressed in sharp tailored suits, Castro is warm and friendly. "I brought my own brush!" he says walking into a room that has been set up for his interview with Billboard magazine, laughing as he waves a small circular bristled brush that he uses to smooth his jet-black hair. Despite having aides at the ready and a makeup artist on the set, the brush that Castro had tucked into the breast pocket of his charcoal suit is just another example of his preparedness and poise. Secretary Julian Castro in Coral Gables, Florida. If Clinton becomes the Democratic Party's nominee and picks Castro, the Mexican-American would be the first Latino to run for the second-highest office in the United States. 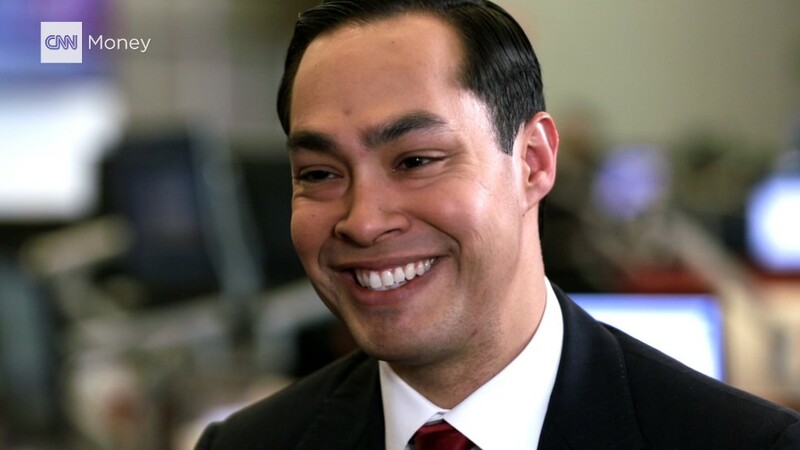 Castro, who before his HUD appointment in 2014 was the mayor of San Antonio, continues to tiptoe around the idea that he is a favorite for vice president. "I've said, and I've said consistently, that I fully expect to be back in Texas a year from now and that I'm trying to do a great job at HUD," says Castro. "The number one way to have a good future is to not forget about what's right in front of you." Castro speaks with a milky, soft voice. He makes direct eye contact when he talks and has a honed ability to know what to say and when. He jokes that his aides warned him about being too honest about his musical tastes -- presumably because they are a bit prosaic, and perhaps tailored to the measured politician that he is. They include Jay Z, Billy Joel, Vicente Fernández (he knows his songs by heart), Michael Jackson and Jon Bon Jovi. The lattermost artist, as chairman of the Jon Bon Jovi Soul Foundation, which works to end hunger and homelessness, is a fan of Castro's too. "Secretary Castro recognizes that projects, to have lasting impact on homeless populations, should provide a framework for prevention as well," says Bon Jovi. Music always has played an important role in Castro's life. Growing up, Joan Baez, The Rolling Stones and mariachi king Fernández were family favorites. Related: The Latino vote -- Will the sleeping giant finally choose the next president? Castro and his twin brother, Joaquin, a Texas congressman, were raised by their mother, Rosie, a well-known Chicano activist, and grandmother Victoria in a mostly working-class section of San Antonio. The Castro name is the matrilineal mark on the family, passed down from his grandmother to his mother and then to the brothers. Henry Cisneros, the former San Antonio mayor and HUD Secretary, remembers Castro's mother from the time they were both children in San Antonio. He recalls Rosie bringing the boys to work with her, where "they got an early taste of community involvement," says Cisneros. Obama cited Castro's family history in a speech nominating him for HUD Secretary, noting that Castro's grandmother had worked as a maid and a babysitter so that the brothers would have a stable home. "Julian ha vivido el Sueño Americano," Obama said in Spanish. "And it's precisely because he has lived out the American Dream that he'll work his tail off to make sure more people can travel that same path and earn their own dreams as well." Before going on to graduate from Harvard Law in 2000, Julian and Joaquin went to Stanford, where they participated in student government and graduated in 1996. When he was accepted to Stanford, Castro's mother was making about $20,000 a year and his grandmother's income was limited to "a few hundred dollars in Social Security checks," he recalls. He credits Pell grants, Perkins loans and federal work-study programs with making Stanford accessible. "That informed my belief that our nation is at its greatest when it matches hard work with real opportunity in people's lives." Joe Holley, an editorial writer and columnist for the Houston Chronicle who covered Castro while he was mayor of San Antonio from 2009 to 2014, described him as "something of a technocrat" early in his political career. Since then, Holley says Castro has become "livelier and much more engaging. He has been preparing for this his whole life, for this role he's playing, and he's not going to mess it up." Castro's political rise seems to mirror that of two of his biggest fans: Cisneros and Obama. Obama and Castro are Harvard graduates who were raised largely by single mothers, and both have grassroots history. Obama's memoir Dreams From My Father: A Story of Race and Inheritance was published in 1995, before he campaigned for state senate in Illinois, and republished in 2004 after his DNC speech. Castro started his memoir a few years ago but has had to put it on hold as Cabinet rules do not allow him to work on it while he is in office (he plans to recommence at a later date). Both Castro and Obama are married with two children, and also possess seemingly even temperaments. Unsurprisingly, Castro downplays any similarities between him and POTUS. "I won't be presumptuous enough to put me and my family on the same level as the president and his family," he says. (Castro has been married for nine years to schoolteacher Erica Lira Castro.) "I believe that, for minorities in general, watching the president and his family and how close they are and what a good example they have set has been inspirational to so many of us." So far the press generally has been friendly to Castro. But as the election season heats up and Castro gets closer to a possible VP nod, detractors are beginning to emerge. Earlier in April a coalition of progressive activists called out Castro and HUD for selling distressed mortgages to Wall Street banks instead of nonprofits. The attack was seen by some as an attempt by supporters of Democratic presidential candidate Bernie Sanders to discredit Castro as a politician who is cozy with Wall Street rather than someone who is protecting the many black and Latino homeowners who were affected by the housing crisis. "When you clear away the politics and focus on the substance of the issue, HUD has made tremendous strides in helping hardworking Americans stay in their homes, including the creation of nonprofit pools and delaying foreclosure for a year," Castro said in a publicly released written statement after his Billboard interview. The push back from the far left only lends credence to the Castro-as-VP Beltway rumors. And it's no wonder. According to the Pew Research Center, more than 27 million Latinos will be eligible to vote in the 2016 election. Of that figure, 44% will be millennials and 26% will be members of Generation X.
Hillary Clinton and Castro during a "Latinos for Hillary" rally in San Antonio in 2015. At 41, Castro could connect with the latter population in a way that Clinton, at 68, may not. Castro's Texas roots may also make him the ideal geographic balance to the Democratic ticket, which would be heavily weighted toward the Northeast. There's also the fact that the Democratic vice presidential bench, for now, is shallow. Among the names bandied about are New Jersey Senator Cory Booker, Massachusetts Senator Elizabeth Warren, Ohio Senator Sherrod Brown and Labor Secretary (and Latino) Tom Perez. But Castro, the youngest of the group, seems to have a leg up: He has developed a friendship with Clinton and stumped for her in key states. "She has a genuine interest in how you are doing," says Castro, adding that when it comes to the issues "she understands leadership and policy better than anyone else who's running." For her part, Clinton had kind words for Castro when he introduced her at a rally in San Antonio in 2015: "I have watched you with respect and admiration for a number of years, and it's great to have you in my corner and for all you're doing to make America's future brighter." Castro also could prove to be the Democrats' best weapon against the Republican Party and their current frontrunners, Donald Trump and Ted Cruz. For decades, the Republican Party has struggled mightily to wrangle voters of color into the fold. In 2012, Mitt Romney pulled in just 27% of the Latino vote, forcing the party to acknowledge its lackluster support among Latinos and other minorities. Staunchly anti-immigration, Cruz has stumbled when playing the Hispanic card while Trump is proving even more damaging as the consequences of his incendiary rhetoric play out. In August 2015, two Boston men allegedly beat a homeless man while making anti-immigrant statements and invoking Trump's name. In Iowa and Indiana, students taunted Latino basketball players by shouting "Trump!" at them. "I saw what happened with that basketball game. I saw what happened with the gentleman who was beaten up in Massachusetts. It's not surprising when you have someone as reckless as Trump has been, that people would act out," says Castro. "That's not the kind of country that's going to continue to be the most prosperous country in the world. That's not the kind of country we want for our children." Given the Republican strategy, there clearly is an opening for a potential running mate like Castro to succeed, says Arturo Vargas, executive director of the National Association of Latino Elected and Appointed Officials. "If Donald Trump becomes the nominee, it may just be this convergence of movements, an anti-Trump movement, that entices Latinos to come out and vote," says Vargas. Castro's grandmother, an orphan, came to the United States from Mexico in 1922 when she was just a girl. She and her younger sister crossed the border into Texas and settled in San Antonio. "That immigrant story is the story of people with different skin colors and from different nations who have all come together to make the United States as prosperous and successful as it is today," says Castro. "If we had done what Donald Trump wants us to do ... if we had done that generations ago, we wouldn't be nearly the caliber of country that we are today. It's a wrong-headed policy. It's laughable." But Castro's not worried. "I don't believe any of it will come to fruition because I don't believe he's going to get elected." Still, doesn't the rhetoric bother him? "More than anything else, it reminds me that this is a view from a person who's just not right or not appropriate to be the president of the United States," he says. Castro's personal story, of having been born in San Antonio with mediocre Spanish skills (he describes himself as a 4 out of 10), reflects the narratives of many Latinos. "It used to be that people only thought [of Latinos] in terms of English or Spanish," he says. "Many Americans see the Latino community as this monolith, but it is very diverse." Unlike African-Americans, Latinos in the United States have never had a national leader. When pressed, Latinos offer up names like Univision anchor Jorge Ramos and Supreme Court Justice Sonia Sotomayor. "There's progress being made," says Castro, who is generous enough to compliment the competition. "We do have more Latinos that are becoming senators and two that ran or are running for president." 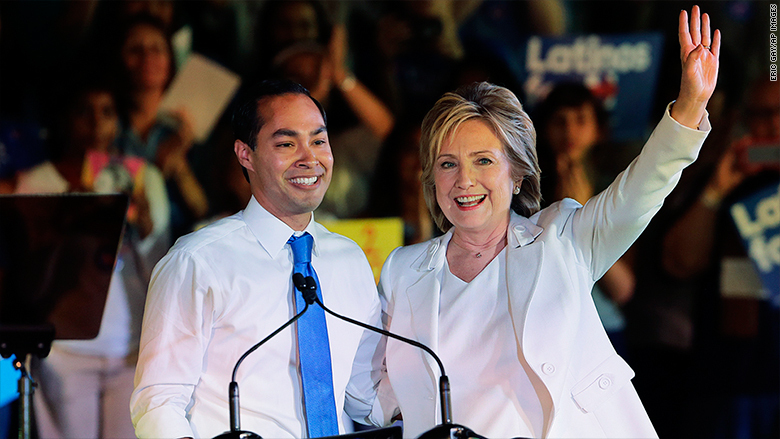 So is Julian Castro the Great Latino Hope of America? Not if you ask him. "I don't believe that there is one singular leader -- and that's not a bad thing," says Castro. "Each person is challenged to become their own leader. We don't have to wait for any one given leader to do that." This story originally appeared in Billboard's Latin Issue.